A little Jake came into view about 100 yards away. He briskly walked the barbed wire fence line towards our set up, but he was way out of range. I nudged the young man asleep on the ground next to me. Noah is nearly 12, he stands 5’9” tall and weighs in at about 135 pounds. He is my man sized child, but he really is just a kid, and I have to remind myself of that. My kid and I am one proud papa. He awoke with a startled look on his face, like he was shocked to be asleep at all. I told him I saw a turkey and pointed. With a somber and determined face he slowly sat up, putting his back to a tree and grabbed his gun. With a nod I started calling, my box call resonating down the valley. The Jake kept moving, like something had disturbed him, then another turkey, a large Tom, appeared from the tree line. This bird was nearly running after the little Jake. I gave him a few clucks from the old box call. His head snapped up and I watched as his attention turned to the decoy I had set 10 yards in front of us. The bird ran up the hill, stopping with a good view of the hen at about 45 yards and began his gobbler dance. He strutted and gobbled, then strutted some more. He slowly snaked his way toward the decoy. Noah and I had set ourselves up on a fence line tree grove. We had seen the birds congregate in this area many times and knew there patterns from the year prior. The bird closed the distance quickly, not playing out the call and dance routine. As the Tom closed the distance he stayed right on the fence line, downhill from us. The birds head disappeared behind a small tree and I whispered for Noah to raise his gun. Then the bird stopped, I am certain that he heard us. The old Tom deflated his body, feathers falling and head now looking at the trees, not at the decoy. He took a few more cautious steps in our direction. Unfortunately, I had chosen a poor set up tactic. I was on the downhill side of Noah. For him to shoot he would have to do a half cross over my body. That is just a bad idea. We both froze, the toms red head bobbing up and down trying to figure out just what these odd looking trees were. His head went behind another tree, Noah swung his gun at the bird. As low as I could mutter – my lips barley moving and my heart pounding more than if I held the gun – I told Noah to shoot as soon as I moved. I slowly placed my hands on the dirt beside me. The Tom noticed and started back down the hill. With as much mojo as I could muster I pushed myself backwards and prone. 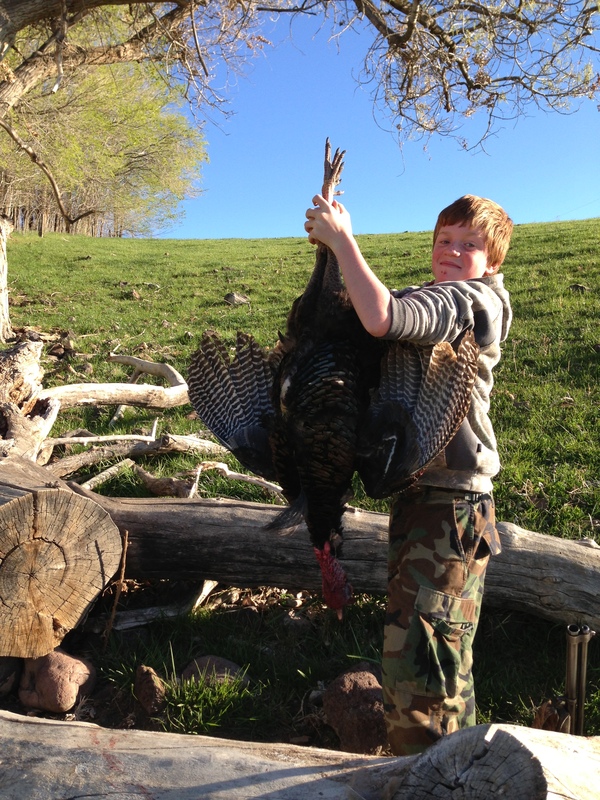 Out of the way of the muzzle blast…and out of the shot picture for Noah. BANG! I moved and he shot. Perfect. The bird fell, did the dead turkey flop and settled at the bottom of the hill. We grabbed our gear and make quick work of the evisceration. We high fived, we hugged…I nearly cried. He asked when deer season started. My heart filled. Maybe I am waxing philosophically about this milestone in this young outdoorsman’s life, but I truly hope it was formative. Those two minutes of turkey hunting will be burned into his mind forever. I know my first bird is still – 22 years later – very vivid. He is a good kid and if he keeps it up he will be a great man. I love you Noah.